As global warming intensifies, efforts to understand the changes in extreme climate events have increased in recent years. 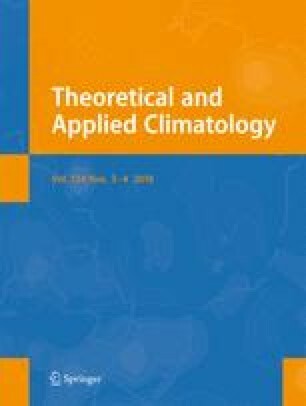 A combined analysis of the changes in extreme temperature and precipitation events is presented in this paper. Using observational data from 1961 to 2015, a set of hotter and wetter (HW) events is defined, and we examine the changes in these events across China. The results show that more HW events occur in Central and Eastern China than in other subregions, especially in South China (SC). The rate of increase in HW events is 2.7 and 1.9 per decade in SC and East China (EC), respectively. In China, most HW events occurred in the last 20 years of the study period, indicating that China entered a period of high-frequency HW events. Indeed, the range in anomalies in the torrential rain days is greater than that of the high-temperature days in Northwest China (NWC), Central China (CC), and EC after the mid- to late 1990s. The opposite pattern is found in Northeast China (NEC), Southwest China-region 1 (SWC1), Southwest China-region 2 (SWC2), and SC. Finally, the increase in HW events in most regions of China is closely associated with warming. We would like to thank the Climate Data Center (CDC) of the National Meteorological Information Center for making the data available. We acknowledge support from Anhui Meteorological Fund (Grant No. KM201605), Climate Change Special Fund (Grant No. CCSF201734), and Anhui Meteorological Bureau Innovation Team Project.